Hot rods! Thousands of them! That’s what you’ll see this Friday and Saturday at the Shades of the Past 2012 Hot Rod Roundup #30, at Dollywood’s Splash Country, September 7-8. Featuring rods, customs and classics, there will be some of the sweetest body and paint jobs, and hot motors, you’ll ever see in one place. This is the 30th year of a legendary event, and Splash Country has proved a great location for it these last couple of years. There’s a huge exhibit area for the cars, with a giant vendor/swap meet also both days. The AMSOIL 2012 Street Rodder Road Tour is making a stopover at the event coming straight from the hot rod US Nationals at Indianapolis. 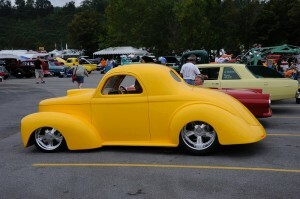 And there will be the usual Deuce Gathering which should draw over 100 of the ’32 Ford coupes. Parking is plentiful, with 15 acres of free parking within walking distance. From town the trolleys will run to and from the show entrance. Some of Dollywood’s parking lot will be available also, with free Dollywood trams to and from the show. Kids under 12 are free, big kids over 12 (that’s us grown-ups) are $10 per day. For full details go to the Shades of the Past web site. Gates open Friday at 8 am, with judging for the Top 25 rods during the day. They’ll be announced Saturday morning, and on display in the Winners Showcase. Take a look at the 2011 Shades Top 25. At 4 pm Saturday admission closes and the awards begin, including – to name a few – the Mighty Muscle picks, the Street Rodder Top 100, the Shades Top 25, the Top 5 (selected from the Top 25 eliminations during the day), Best Street Rod and Best of Show. The #2 prize of the show is $10,000, while the winner of the #1 prize will get a beautiful ’32 Ford Highboy Roadster – here’s last year’s 2011 Shades of the Past HiBoy prize. It’s going to be an amazing show – even if you don’t like cars you’ll want a street rod by the time you leave!